I would highly recommend Dr. Duke for any dental needs. My experience with Dr. Duke was excellent! I was visiting Missoula on a weekend and my 9 year old daughter needed a tooth pulled. Dr. Duke came in on a Saturday just to see her. I was impressed by how gentle he was. My daughter didn’t even know she was getting a shot; he was that good. The tooth was out so fast she thought he was just looking at it. I appreciate the friendly but professional atmosphere. I also appreciate the fact that he took the time on a weekend to help both of us learn more about how to improve both our oral and overall health as well. Clearly he is incredibly knowledgeable about dentistry and cares about his patients. I would highly recommend Dr. Duke for any dental needs. If I lived in Missoula, he would be my dentist. Looking for a dentist is sometimes tough. When it comes to Dr. David Duke look no further. 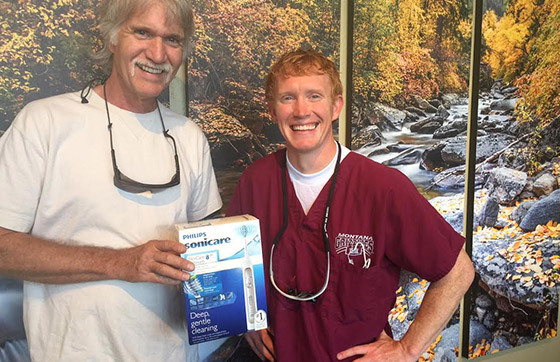 Dr. Duke is truly one of Missoula’s finest dentists. His compassions, concern, gentleness, honesty and dedication to the field is all but amazing and then some. He’s matriculate in his trade as a dentist and treats his patients and staff as family. The atmosphere is refined yet subtle. There’s absolutely no pressure between patient and Dr. Duke in any way when it comes to decisions on a patient’s needs. His demure and professionalism is what I look for in an outstanding dentist. He takes the time, interest and has the understanding as to what you go through, been through or will go through and that is why after three years of service I will continue to be one of his patients. I highly recommend Dr. David Duke to anyone seeking a dentist. Watch the video below for your chance to win. Simply fill out the form below and refer a friend.